If I have some extra time before heading out at the weekend, I'll try a little harder with my makeup or I might try a new style in my hair, but I just point blank do not "pamper" myself with little treatments. This week I have definitely realised that needs to change. I did however recenrly pick up a conditioning treatment from LUSH for my hair, so I'll be giving that a go tonight. I will report back on what I think. I think from this week's challenge, what I'm mostly looking out for is ideas from fellow bloggers. What suggestions do you have for me and my pampering starter kit? I'm the same as you, not big into the pampering! Very interested to see how you get on with that conditioning treatment though, sounds fab! 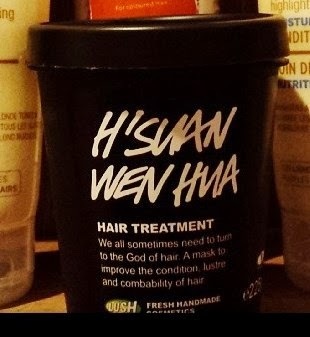 I really want to try that hair mask! I highly recommend face masks for a bit of pampering and I know Lush bath bombs are a popular pamper product! That looks really good! I haven't been to Lush in ages, have to pay them a visit soon! This looks great :-) I use Vichy Aqualia Thermal Masque to keep my skin hydrated and the Vichy Normaderm 3 in 1 Cleanser/Exfoliator/Mask to help clear up spots. You need to book yourself a massage. Im not one to do the pamper thing at home either so I go and get treatments done in the beauticians. I also need to remind myself to take one day a week to relax and disconnect from the outside world. I think you just need to go into Boots and treat yourself to what looks good for your skin, there's 3 for 2 on nearly everything at the moment!